Jun. 18, 2015, 9:31 a.m. In February 2011, Forbes published a particularly egregious bit of clickbait, and it was picked up by news outlets around the world. “Philadelphia tops list of U.S. most toxic cities,” shouted Reuters, in a headline that echoed both locally and abroad. The Forbes rankings were based on a few factors, but it was what was referred to as Philadelphia’s “really poor water quality” that gave our city a lock on the top spot. What gives? Is the stuff coming out of our taps really among the worst in the nation? Should we all start bathing in Poland Springs and ponying up an extra $5 at dinner to sip something that won’t kill us? What Forbes and its blind followers got wrong is they took a (relatively spurious) low ranking for Philly’s watershed and misconstrued it to mean the same rating applies to our drinking water. It’s a common error, according to Gary Burlingame, a 36-year Philadelphia Water employee who’s now director of its Bureau of Laboratory Services. Interpreted properly, the watershed rating means that more attention is paid to the end product. Instead of bad, the less-than-ideal starting point means care is taken to make sure the end product — Philly tap water — is actually quite good. Burlingame readily admits that what goes in to Philadelphia’s water supply is not pristine, by any means. The system’s three remaining intakes are right next to the city, with two on the Schuylkill (the Queen Lane Plant in East Falls and the Belmont Plant in Wynnefield) and one on the Delaware (the Baxter Plant in Torresdale). Both rivers are cleaner now than any time since the Industrial Revolution, but samples from them still wouldn’t hold a candle to the Catskill mountaintop reservoirs that supply NYC, for example. New York water coming through its upstate aqueducts is actually not treated before it slides into distribution pipes. But because it’s taken for granted that Philly’s starting point is less than ideal, our municipal water department has developed some of the best treatment facilities in the U.S. The water that pours from Philly faucets is actually among the cleanest and safest in the country. @phillydesign And New York water isn’t as good as New Yorkers say it is. Treatment at the plants happens in several steps. First, river water is pumped into reservoirs to allow sediment to settle out. Then it’s disinfected with as little Sodium Hypochlorite as necessary — this kills bacteria and other organisms. (Sodium Hypochlorite is also known as the primary ingredient of laundry bleach.) It goes through a second round of gravity settling, this one enhanced by a coagulant that causes small particles to clump together, and a second round of disinfection. Then it’s sent through microfilters that remove any remaining tiny particles, and finally it’s fluorinated and sent out into distribution pipes. The system wasn’t always this complex, or effective. 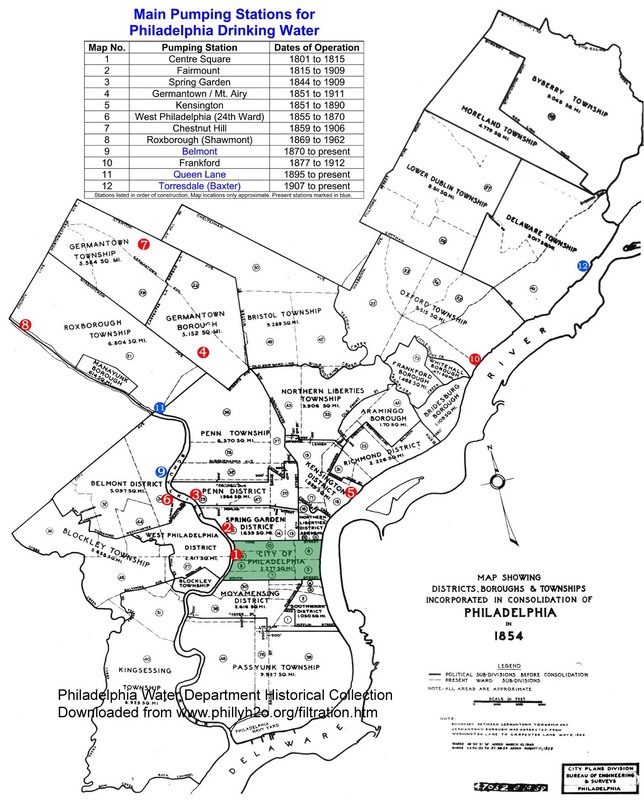 Philadelphia was one of the first U.S. cities to provide municipal water, with the first pumping station built along the Schuylkill in 1801, and several added after that (the Monopoly-famous Fairmount Waterworks came on the scene in 1815). But it wasn’t until more than 100 years later that all the drinking water provided by the city was actually filtered. Throughout the 1800s, Philly’s rivers continued to get more and more polluted, as factories and mills used them and the many streams that ran through Philadelphia for waste disposal. Even the 1828 establishment of Fairmount Park, purchased by the city to try to protect the watershed, did not help the quality of the Schuylkill — upriver dumping continued unabated. Typhoid epidemics were rampant, thanks to bacteria from human waste being pumped back into sinks. In the late 1800s, filtration was suggested as a solution, but building the proper plants was costly, so they were held back by political bickering. Finally, at the turn of the 20th century, consensus was reached and five plants were built. By 1909, all the city’s water was being filtered, and in 1914, the chlorination step was added. Disease incidence plummeted. The next big step forward came in the 1950s, when Philadelphia Water was given control over sewage and some federal funds to help deal with it. Instead of just letting industrial and residential wastewater flow untouched back into the rivers, wastewater treatment plants were constructed. As the contaminant levels of the source water decreased, so did the amount of necessary added chlorine. Thanks to upgrades throughout the next few decades, by the 1980s up to 95% of pollutants were being stripped before wastewater was allowed back into the watershed. It made a big difference, and the taste of Philadelphia’s drinking water markedly improved. Of course, water doesn’t just exit the treatment plant and magically appear at a faucet. It has to travel through some 3,000 miles of piping before it arrives, and that can also affect taste. Many of the large pipes are 100 years old — these are the water mains that always seem to be springing leaks. Philadelphia Water does add a bit of Zinc Orthophosphate to the water to help minimize pipe corrosion, but the upkeep of the system is an ongoing battle. Preventative maintenance isn’t the only thing Philadelphia Water spends money on, though it does take a large chunk of the $10 million operating budget. Technological advances in filtration and treatment chemicals are constantly being adopted, and water quality testing is also being improved. Burlingame’s laboratory, which is located on Hunting Park Avenue in Juniata and employs 78 people, tests at least 400 samples of Philly drinking water each month, taken from more than 65 spots around the city. They also now deploy robots. Over the past decade, more than 40 miniature “robot laboratories” have been installed in secret locations all over Philadelphia. Instead of samples that need to be brought back to the lab, these automated microlabs do continual onsite quality testing, then transmit the results back to HQ via Wi-Fi. “We’re on the cutting edge of that technology,” Burlingame says with pride. All that’s well and good, but what if you’re thinking, “ Philly tap water still tastes bad!” If that’s the way you feel, you’re probably just not from here. Because of the way it’s treated, Philly water has a predominantly chlorinous smell with an occasional musty scent. If you grew up drinking that water, it’s your baseline, your normal. @phillydesign Except on days when it seems to have extra chlorine, I think it tastes fine. May have killed my tastebuds, though. @phillydesign I believe @meechone will back me up that anyone who doesn’t like the taste of Philly tap is not From Here. If you were raised in Florida, where the groundwater has high levels of sulfur, you might think Philly water tastes like ambrosia. If you grew up in New York, where water is untreated, you might find Philly water tastes chemical-ridden. Either way, what you taste isn’t bad for you. It’s the residual of the treatment that makes the water safe. @phillydesign I’m not from here and I love the taste of Philly tap water. I’ve had some awful stuff elsewhere (ahem, Florida). One caveat: the algal blooms of spring. Even those natives who swear by Philly tap often notice an increase in the musty, earthy taste of water each April and May. That’s unavoidable, Burlingame says — algae growth spikes as the weather warms, leading to an increase in chlorination. It’s temporary, though, and by summer the levels are usually back to normal, though later blooms can also occur. Why does all the tap water in Philly suddenly taste like hose water? I’m no snob it’s recently become awful. Best way to combat the off flavors? Whether you’re filtering through Brita or not, keep your drinking water in the fridge. Cooler temperatures reduce the volatility of aroma molecules, so while cold water doesn’t actually have less chlorine in it, you won’t notice it nearly as much.